NEW ICOM IC-V88 IP67 Waterproof 5.5W EXP/LMR(Land Mobile Radio) VHF MDC1200 Compatible 136-174Mhz Radio w/BP-278+BC-213. 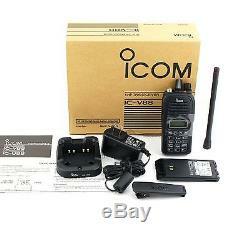 Product code: ICOM IC-V88 The IC-V88 comes with. IC-V88(with hologram Genuine Anti Fake ICOM label on box and IC-V88 body) VHF EXP Transceiver(TX/RX:136-174MHz), the IC-V88 is a LMR-Land Mobile Radio that need to be set up channel before using it. BC-213 with BC-123 100-240V AC adapter rapid Li-ion desk charger(we can offer different converter adapter plug due to different area). MB-133 Alligator type belt clip. Please ask before you place order. Slim dimensions IC-V88 (Left) and IC-V80 (right). IP67 Waterproof and Dust-tight Protection. 800mW Clear Companded Audio with Large 36mm Speaker. 5.5W/4.0W (VHF/UHF) of Output Power. 10.5 Hours of Operating Time with Supplied Waterproof Battery. Built-in CTCSS and DTCS encoder/decoder. MDC 1200 PTT ID and 100 Alias Memories. Inversion Voice Scrambler (16 Code) for Private Conversation. Channel Announcement of the Operating Channel Number. Seven Programmable Buttons with Shift Key Function. 30°C to +60°C (Radio only). Dimensions (W×H×D) (Projections not included). 52.2×111.8×22.3 mm (with BP-278). Output power (at 7.5V). 5.5/2.0/1.0W (Hi/L2/L1). 3-conductor 3.5(d)mm. Icom makes rugged products that have been tested to and passed the following MIL-STD requirements and strict environmental standards. Also meets equivalent MIL-STD-810 -C, -D, -E and -F.
IP67 (Dust-tight and waterproof protection). All stated specifications are subject to change without notice or obligation. The item "NEW ICOM IC-V88 IP67 5.5W EXP/LMR VHF 136-174Mhz MDC1200 Radio withBP-278+BC-213" is in sale since Saturday, October 11, 2014. This item is in the category "Business & Industrial\Facility Maintenance & Safety\Surveillance & Alarm Equipment\Two-Way Radios". The seller is "palacemuseum" and is located in Taipei Taiwan. This item can be shipped to United States, all countries in Europe, all countries in continental Asia, Canada, Mexico, Brazil, Australia.